Halley's Comet passed perihelion during its sixteenth known trip through the inner solar system, as determined from records by Chinese astronomers. Vega became the first star in human history, excluding our Sun, to have its picture taken, the photo captured by Harvard Observatory. Robert Goddard launched his fourth successful liquid-fueled rocket flight, the first carrying instrumentation, which reached a height of 90 feet during its 18.5 second flight. The fourth flight of one of Robert Goddard's liquid-fueled rockets took place on 17 July 1929, the first carrying instruments. The rocket started to lift 13 seconds after ignition, rose off the tower at 14.5 seconds, reached the top of its flight (90 feet) at 17 seconds, and hit ground after 18.5 seconds, landing 171 feet from the launch tower. The rocket carried a small camera, thermometer, and a barometer, which were recovered intact after the flight. The flight was bright and noisy, and attracted public attention, resulting in a great deal of "moon rocket" publicity. This resulted in a prohibition of further test flights from Aunt Effie's Farm by the local fire marshall. The rocket was 11 feet 6 inches long, with a maximum diameter 26 inches. Its dry weight was 32 lb; it carried 14 lb of gasoline and 11 lb of liquid oxygen, for a total loaded weight of 57 lb. Through the time of this launch, Goddard had achieved numerous proving-stand tests of liquid rockets, and had made 10 attempts at flight tests, of which four achieved flight. The first mobile telephone call was placed by a driver in St. Louis, Missouri. For years, the link associated with this event has pointed to a page at AT&T describing the first mobile telephone call. On 17 July 2016, while checking the link, it was discovered the page is no longer there - the link ends now up at some generic AT&T "Innovation Labs" page that has no useful search functions: Searching for the missing page yields 1251 results, and none of those examined appears to be in any way related. Thus AT&T's Web site is no longer a useful source of historical information. C. A. Wirtanen discovered asteroid #1685 Toro. Arco, Idaho became the first US city lit by nuclear power. NASA and the USAF launched X-15A MH-96 Demo Test mission # 62 in which Robert White reached an FAI world altitude record - 95.936 km and a max. 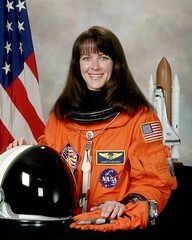 speed of 6166 kph (Mach 5.45), earning White the first astronaut wings for an aircraft pilot (USAF definition). As Apollo-ASTP and Soyuz 19 docked, the first such international mating of spacecraft in orbit, the Apollo-Soyuz Test Project became the first US-Soviet joint space mission. With Soviet-American detente crumbling, it became the only docking for 20 years. On 15 July 1975, the US and the USSR launched an Apollo-ASTP and Soyuz 19, respectively, as a joint effort called the Apollo-Soyuz Test Project (ASTP). The Soyuz was launched first, with a two man crew who placed their spacecraft into a docking orbit. The Apollo was launched 7.5 hours later, with a three man crew who maneuvered their spacecraft into a proper configuration for docking with the Soyuz. The docking took place on the third flight day, 17 July 1975. 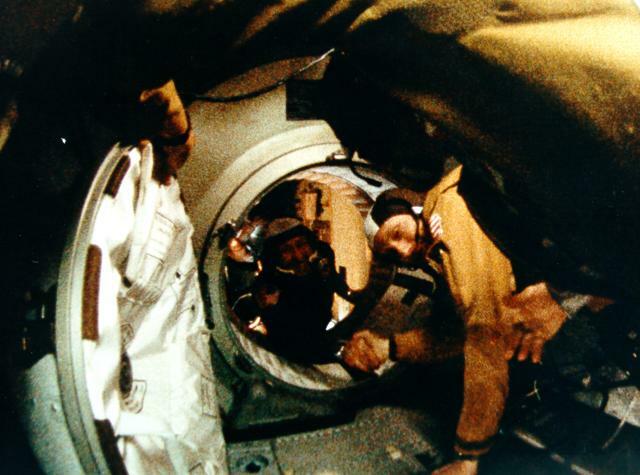 After docking, crew transfers took place, with the Apollo crew first visiting the Soyuz. The combined crews performed joint experiments, and presented radio and TV reports. After the joint operations were completed, the spacecraft disengaged, and each continued its separate mission. USSR launched Cosmos 929 from Baikonur, the first (unmanned) flight test of the TKS manned shuttle, which maneuvered extensively while in orbit. Edward L. G. "Ted" Bowell discovered asteroids #2554 Skiff, #2555 Thomas, #2587 Gardner, and #3341 Hartmann, #3452 Hawke and #3696 Herald. USSR launched Soyuz T-12 from Baikonur, transporting ship's commander V. A. Dzhanibekov, flight engineer S. E. Savitskaya and research cosmonaut I. P. Volk to the Salyut 7 orbital station, to conduct scientific and technical studies and experiments. USSR Cosmos 1667, the second Soviet biosatellite with a primate payload, returned to Earth after a week in orbit. Bion 7 (Cosmos 1667), launched 10 July 1985, was a biological research satellite which carried two monkeys named Verniy and Gordiy to orbit for continued investigations of the influence of space flight factors on living organisms and radiation physics research. Cosmos 1667 was the second USSR biosatellite mission with a primate payload, and also featured a large rodent payload. The US conducted a single cardiovascular experiment on one of the two flight monkeys. Countries participating in the mission included the USSR, US, France, Czechoslovakia, the German Democratic Republic, Poland, Romania, Bulgaria and Hungary. Cosmos 1667 returned to Earth on 17 July 1985. USSR launched Molniya 3-25 from Plesetsk to operate the long range telephone and telegraph radio communications system in the USSR, and to transmit USSR Central Television programs to stations in the Orbita network and in international cooperation. During the 7h 16m Mir EO-6-1 EVA, cosmonauts aboard the Mir space station repaired a rip in the insulation of Soyuz TM-9 in which 3 of 8 thermal blankets had come loose near the heat shield. USSR launched Resurs F-7 from Plesetsk for investigation of the natural resources of the Earth, in the interests of various branches of the national economy of the USSR, and solution of problems relating to ecology and international cooperation. An Ariane 4 launched from Kourou carried the ESA ERS 1 radarsat, the UK Oscar amateur radio satellite, the US Orbcomm-X communication satellite, the German Tubsat-A technology comsat, and the French SARA radioastronomy satellite to orbit. A first stage separation problem in the Pegasus/HAPS rocket launched from Edwards carrying the Orbcomm Microsat 1-7 LEO satellites for the global communications network caused a guidance error; the resulting orbit had half the intended perigee altitude. Vladimir Pavlovich Barmin (4 March (17 March Old Style date) 1909 - 17 July 1993) received his engineering degree from the Bauman MVTU (Moscow Higher Technical University) in 1935, and began work in the Kompresor Factory. By 1941, he had become the head of the design bureau that designed the Katyusha barrage rocket system which was very effectively used by Soviet forces in World War II. After the war, he was assigned to develop launch equipment for the Russian copies of German missiles. He went on to become the pre-eminent Soviet designer of rocket mobile launchers, fixed launch complexes, and missile silos, culminating in the design and construction of the immense facilities at Baikonur for launch of the N1 and Energia super-boosters. Barmin also supervised design of the planned Soviet Lunar base until that project was terminated in 1974. He received innumerable awards and decorations for his service to the Soviet Union in the missile and space race, and was named an Academician of the Academy of Sciences in 1966. The Spektr module was transferred by the small manipulator arm on Mir to its final location at the Mir transfer compartment's starboard radial port. NASA's STS 94 (Columbia 23, 85th Shuttle mission) ended when Columbia landed at KSC after carrying the Microgravity Science Laboratory-1(MSL-1 Reflight) experiment package to orbit. The 1 July 1997 liftoff of STS 94 was delayed about 12 minutes because of unacceptable weather conditions in the launch area in the event a return-to-launch-site abort was necessary. STS 94 marked the first reflight of the same vehicle, crew and payloads, following the shortened STS 83 mission in April due to indications of a fuel cell problem. The primary payload was the Microgravity Science Laboratory-1 (MSL-1). A quick turnaround in processing Columbia for the reflight was accomplished in part by the first reservicing of a primary payload, MSL-1, in the orbiter. During the flight, the crew maintained 24 hour, two-shift operations. Using the Spacelab module as a test bed, MSL-1 tested some of the hardware, facilities and procedures that were to be used on the (then upcoming) International Space Station. The 33 investigations conducted also yielded new knowledge in the principal scientific fields of combustion, biotechnology and materials processing. Combustion experiments resulted in the discovery of a new mechanism of flame extinction caused by radiation of soot, the ignition of the weakest flames (as low as one watt, or 1/50 the power of a birthday candle) ever burned in laboratory conditions in space or on Earth, as well as the longest burning flames in space (500 seconds). Although only 144 fires or combustion experiment runs were scheduled, more than 200 were completed. The combustion investigations provided valuable information for improved fire safety on future spacecraft and for development of cleaner, more efficient internal combustion engines. Experiments processed in the Electromagnetic Containerless Processing Facility (TEMPUS) yielded the first measurements of specific heat and thermal expansion of glass-forming metallic alloys, and the highest temperature (a maximum of 2,000 degrees Centigrade) and largest undercooling (to 340 degrees C) ever achieved in space. These measurements are necessary for modeling industrial materials systems to manufacture new and better products. The mission also produced progress in learning how to control and position liquid drops which could lead to improvements in chemical manufacturing, petroleum technology and the cosmetics and food industries. The crew performed over 100 test runs (more than double number planned) in the Middeck Glovebox Facility in areas of liquid and bubble behavior, fluids-based heat transfer devices and solid-liquid mixtures. Droplets of a hydrocarbon, heptane, were burned at the lowest atmospheric pressure achieved during a mission. More than 700 crystals of various proteins were grown during the 16 day mission. Since crystals grow larger and purer in space, this research will help scientists to better understand their structures and to design more effective drugs to treat such diseases as cancer, diabetes and AIDS. Samples in the Large Isothermal Furnace were processed to study the diffusion of tracers, or impurities, in melted germanium, an element used as a semiconductor and alloying agent. This was the first time diffusion in semiconductors has been studied in space. The Astro/Plant Generic Bioprocessing Apparatus (AstroPGBA) studied the effect of microgravity on various plants, including a source of an antimalarial drug; another used in chemotherapy treatment of cancer; and a species widely used in the paper and lumber industries. The Expedite the Processing of Experiments to Space Station (EXPRESS) Rack flew for the first time on MSL-1 (both the STS 83 and STS 94 missions) to demonstrate quick and easy installation of experiment and facility hardware on orbit. It will be used on the International Space Station. The 25 primary experiments, four glovebox investigations and four accelerometer studies on MSL-1 were contributed by scientists from NASA, the European Space Agency, the German Space Agency and the National Space Development Agency of Japan. A record number of commands (more than 35,000) were sent from Spacelab Mission Operations Control Center at Marshall Space Flight Center to MSL-1 experiments. STS 94 ended on 17 July 1997 when Columbia landed on revolution 251 on Runway 33, Kennedy Space Center, Florida, on the first opportunity. Rollout distance: 8,892 feet (2710 meters). Rollout time: 55 seconds. Orbit altitude: 184 statute miles. Orbit inclination: 28.45 degrees. Mission duration: 15 days, 16 hours, 44 minutes, 34 seconds. Miles traveled: 6.2 million. The flight crew for STS 94 was: James D. Halsell, Mission Commander; Susan L. Still, Pilot; Janice E. Voss, Payload Commander; Donald A. Thomas, Mission Specialist; Michael L. Gernhardt, Mission Specialist; Roger Crouch, Payload Specialist; Greg Linteris, Payload Specialist. Russia launched Okean-O from Baikonur, the first of a new generation of larger Okean oceanographic satellites, carrying a side-looking radar (RSL-BO), and a set of visible and infrared scanners and radiometers. The Rainbow 1 (Cablevision 1) commercial direct broadcast satellite was launched from Cape Canaveral, Florida, and positioned in geostationary orbit. Walter Leland Cronkite Jr. (4 November 1916 - 17 July 2009) was an American journalist, best known for his work as a television news anchorman. During his tenure at CBS Evening News he was often called "the most trusted man in America." For many growing up in the mid- to late-1960's, Cronkite is remembered as "the voice of the space program" for his coverage of American space missions, including the Apollo 11 landing on the Moon.